Chase Schaber will go under the knife in an attempt to get back on the ice for Fife Flyers next season. The 28-year-old forward, from Canada, is scheduled for surgery at the end of the month on the agonising groin injury suffered in October. He will then return to his home in Red Deer, Alberta for a summer of recovery and rehabilitation with the intention of returning for a fourth season in Fife. "I'll go home, do the rehab, get it stronger, and then probably come back," he said. "I love playing for Fife and nothing would make me happier than suiting up again." Schaber's injury was regarded as a turning point in Flyers' campaign as it robbed the team, who were top of the EIHL at the time, of a player described by head coach Todd Dutiaume as the 'team leader'. He showed remarkable courage to return to the ice, playing through the injury in the latter weeks of the season, but in order to get back playing pain-free, an operation is the only option. "I took some time off to let it heal but it ended up being decided that it had to be repaired in order to play at a high pace level," he said. "It's one of these muscles a hockey player needs in his groin, and it's just unfortunate. "I'll get it operated on, get it better, and be ready to go." Schaber is no stranger to dealing with adversity having suffered a career-threatening injury during his time with Kamloops Blazers in the WHL when his hamstring was severed by a skate kick. He also missed the entire season 2015-16 season with ECHL outfit Norfolk Admirals due to an 'unfortunate accident', which he again recovered from, making a move to Fife that summer, and becoming an integral part of the side. It is this incredible determination and willpower that makes Schaber such an invaluable player to Flyers. "If you're pretty decent at something might as well do it as long as you can," he said. "I absolutely love playing the game, and I love playing here, the team we've got and what Dutes and Hutch do with us. "The team they put together, and the boys they bring in are all great characters, and it's a nice place to play in that regard." For the third time in his career, Schaber now faces a challenging summer of building back up his strength and fitness, but he is up for the battle. "Some would think it's difficult, I think it's part of my job," he said. "I'll just take it one week at a time, make progress and start to feel better. "Hopefully I'll be able to make a speedy recover and come back stronger and faster than ever. "The human body is amazing, and what you can do when put your mind to something. "I've done it before and overcame injuries. It's just the level of commitment you want to put in to get better. "That's the cards I was dealt this year, so I just have to be professional about it, take care of it, come back and have a great year." 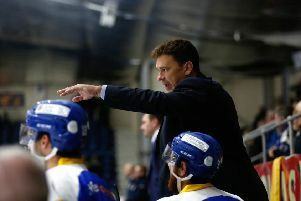 As if playing injured wasn't enough to contend with, Schaber subsequently suffered a season-ending concussion following a hit from Sheffield Steelers defenceman Aaron Johnson. It kept him out of the play-offs, however, he does not expect any long-term complications. "I'm feeling better for sure," he said. "I haven't really done much but I'm sure I'll be okay. "Once I'm able to start physical activity again I'm sure I'll be okay to do that." Schaber admits he has unfinished business in Fife as he still looks to win one of the major trophies on offer in the Elite League. "That's the goal, absolutely," he said. "We got the Gardiner Conference last year, but I want the league, and the play-offs. "I hope we can do that, and I believe that we can. I have a lot of optimism about it. "Dutes and Hutch do a great job recruiting, so we'll see what they put together for next year, and I'll be ready." Schaber believes that the injuries suffered by several players played a part in Flyers failing to live up their early season promise as title contenders. "Injuries are part of sports, they happen all the time, but unfortunately we were dealt an unlucky hand in that department this year," he said. "I really thought we had a team to go all the way, and take it as deep as we could, but there's only so much gas in the tank when we're bodies short all the time. "I thought the boys played great in the play-offs, battled as hard as they could, and did the best they could with what was given to them at the time. "That's what we were dealt with this year, and hopefully next year we'll have a healthy and full squad the whole time."